In this exclusive audio interview Emmy Winner Charlotte Robinson host of OUTTAKE VOICES™ talks with Sam Street and Jonathan Tack about their exquisite jewelry line Proposition Love Jewelry that donates 10-20 percent of proceeds to LGBT related causes. Jewelry industry veterans Street and Tack were married in California just a few days before Proposition 8 was voted in. They were part of the lucky few who never had their right to marry taken away but it made them realize how precious such a thing can be and motivated them to become active in the fight for LGBT equality. We talked to Sam and Jonathan about what inspired them to create Proposition Love Jewelry and their spin on our LGBT issues. 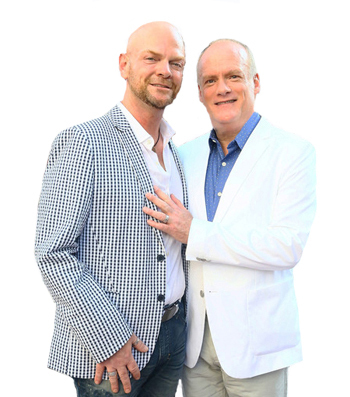 Sam Street and Jonathan Tack founded Proposition Love Jewelry in 2011 as a symbol of love and commitment to one another and a pledge to support the rights of all. Proposition Love Jewelry proudly donates 10% of profits to organizations that support marriage equality, LGBT rights, LGBT youth anti bullying and HIV/AIDS activism. They increased their donation to 20% for all purchases made in the states where gay and lesbian marriage has recently passed. For their Countdown Collection they have created a wedding ring for each state to symbolize the historic moment for the passing of marriage equality. Recently their exquisite LGBT jewelry line has become available at Macys.